This kit revises the DeLorean's rear lower control arms, making them adjustable to allow for correction of the rear suspension camber settings. Camber is the inward or outward tilt at the top of the rear wheels and tires on the car. Many DeLoreans, especially with a lowered suspension, need to have this adjustment made to allow the car to be brought back within factory alignment specifications. 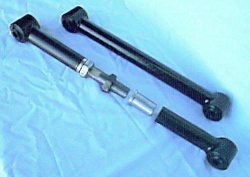 This kit includes all the parts and labor required to modify both (2) rear lower control arms. It includes machined, press-in threaded collar inserts (which must be Heli-arc welded into place), 1" diameter by 6" high strength steel LH/RH adjusters and all adjustment locking nuts. We originally planned to offer a "Universal Kit" of all the parts required to do this conversion, which would allow each owner to perform this work himself. After some research, we have found at least 3 size variations of the rear control arms on the DeLorean. Because of the way these parts are designed and installed, this will now require that we make each "kit" a custom fit to the specific arms on your car. We ask that you remove the lower control arms from your car and ship them to us. We will build and install a custom fit adjustment kit to your specific control arms and return them to you for re-installation. Turn around time to install this "kit" on both of your lower control arms is approximately 1 week. 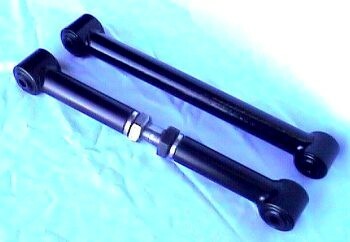 The cost for this "kit" (both control arms) is $210.00, which includes all required parts, modification of your control arms and return shipping*. Please contact Marty Maier - wingd2@aol.com - for information. *Shipping to the continental US. Shipping to other locations will have an additional charge.